On April 15th, the CleanTechnica braintrust was surveyed for their opinions and sentiment on blockchain for cleantech. The results, discussed below, are part of our Cleantech Blockchain series. 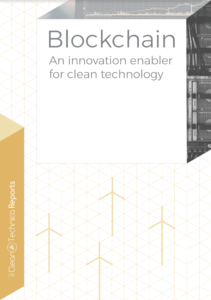 They also connect to our brand new (published today) Blockchain — An Innovation Enabler for Clean Technology report. You were asked 9 questions about the impacts, both positive and negative, of blockchain on clean tech. 115 of you chose to take the survey out of 2,655 who viewed it. Per Survey Monkey, our survey service, that gives us a confidence of plus or minus 10%. The results on this go-round, in other words, are interesting and informative but not conclusive. The first two questions regarded the primary forms of new renewable generation, specifically related to funding. As part of the blockchain series, organizations devoted to providing new funding were covered, including WePower and SolarCoin. In addition, direct funding via initial coin offerings for clean technology was discussed at length. Given that 2017 saw a billion dollars or so in initial coin offerings, and $60 million of that was for clean tech offerings, it’s interesting that roughly 40% of respondents remained skeptical of the potential for this being another funding stream. That possibly relates to general skepticism about cryptocurrencies, which many expressed directly in comments. Also interesting is the 5% variance between responses for solar and wind, with more respondents thinking that solar would receive more funding. 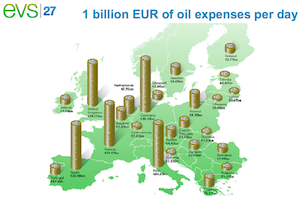 This is possibly due to the reality that small-scale solar is much more viable than small-scale wind energy and the dollars flowing to clean tech funding at present are definitely not on the investment scale of utility-scale wind farms. Many more of you saw the potential for distribution management of electricity on the grid and payment for electricity. Indeed, many of the blockchain solutions we’ve featured, including the Energy Web Foundation and LO3, are focused on exactly that, mediating microgrid and grid transaction of generation to consumption of electricity. Some of these solutions use an intermediary cryptocurrency, but others simply use the distributed ledger capabilities of blockchain to manage the transactions with settlement external to the solution. 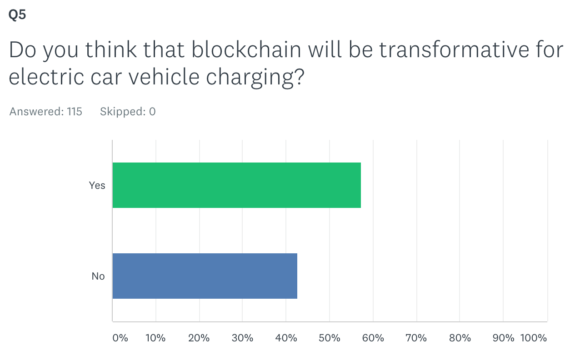 The potential for vehicle-to-grid solutions enabled by blockchain was seen as less likely by even the electric vehicle enthusiasts of the CleanTechnica audience. It’s possible that this reflects the wide variety of solutions that have been discussed in the blockchain series, as buried in one of the pieces was a mention of Tennet’s work with IBM to do exactly this. Not mentioned yet in the series were Innogy SE’s Share&Charge or eMotorWerks blockchain charging solutions. 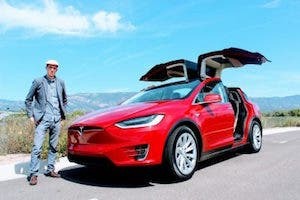 Both are peer-to-peer charging solutions designed to enable people with home chargers to monetize them by having other electric vehicle owners pull into their driveway and pay for some range. eMotorWerks is a California startup which was using Innogy’s blockchain solution, so it’s both a platform and a direct play. Both categories above are supply solutions, but one of the other big areas where electric vehicle charging might be impacted by blockchain solutions is in demand management. 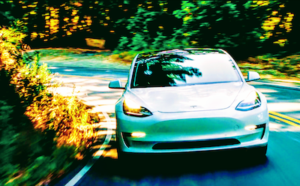 Charging a Tesla is the equivalent of running an electric oven at 400 degrees Fahrenheit, and being able to remotely reduce or eliminate charging load in return for compensation is an obvious negawatts solution which could easily assist with balancing the grid. Unsurprisingly, given the significant attention paid to cryptocurrency electricity consumption, including the more nuanced view taken in the pages of CleanTechnica, the people surveyed were slightly more likely to think that cryptocurrencies will be a net drawback environmentally. With stories of crypto miners setting up shop in places with cheap and environmentally disastrous coal generation, this is a completely understandable concern. While there are many solutions to this problem emerging, not least of which is the collapse in value of Bitcoin over the past months, it’s still a concern worth noting. 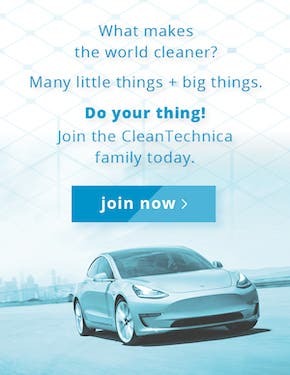 CleanTechnica readers, once again unsurprisingly, are early adopters of technology. This is in line with the psychological profile of people who accept and embrace the need for transformation of energy supply and demand and who embrace technological change in general. At present, only 8% of Americans own cryptocurrency, significantly under the CleanTechnica respondents’ average of close to 40% (remembering the confidence disclaimer at the beginning of this assessment). Given that the expectation of blockchain usage maps very closely to the cryptocurrency ownership, the possible explanation is that the the respondents simply meant that they would transact cryptocurrencies, not necessarily use other blockchain-mediated solutions. And, of course, people interested in cryptocurrencies would be more likely to find and take the survey regardless. The final question was revealing of sentiment. 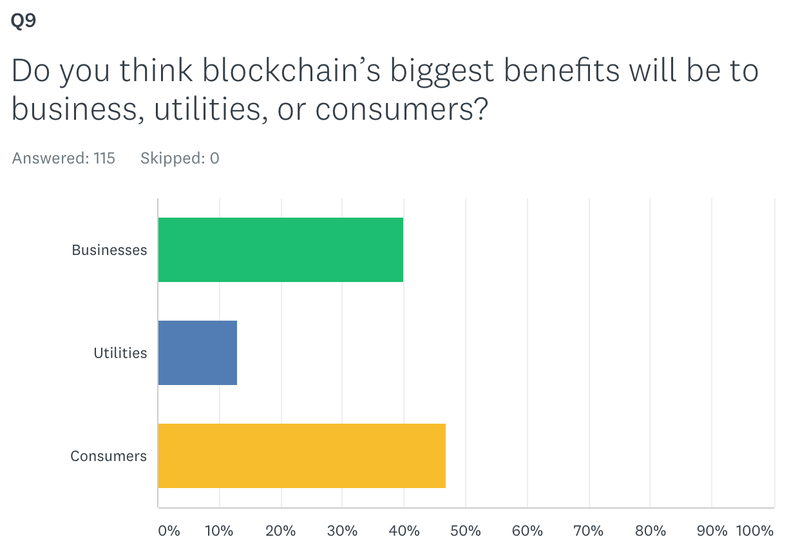 Most respondents felt that utilities would receive the least value from blockchain solutions. 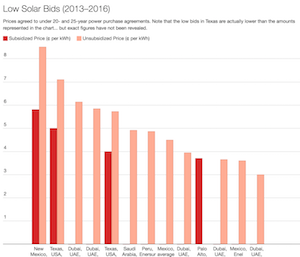 This is in spite of the numerous covered cases such as Tennet and Fremantle, Australia’s PowerLedger, examples where utilities were directly involved in blockchain projects, and the assessment in CleanTechnica of the pros and cons of smart contracts, which indicated that they strongly favoured the seller and must include utilities, which still own the distribution grid. Conversely, the respondents clearly said that the expected winners were customers. The probable explanation for this is the belief that cryptocurrency and blockchain solutions remove middle-men from the solution, combined with a relatively strong preponderance of small-generation and microgrid proponents among CleanTechnica’s audience. Utilities seem to be considered more evil than not, as opposed to both necessary and valuable. Given that utilities continue to be, by an outrageous margin, the largest purchasers, distributors, and sellers of renewable energy, if blockchain solutions don’t bring them value but indeed hurt their business models, there’s a strong potential for a very ugly disruption of society instead of a positive one. 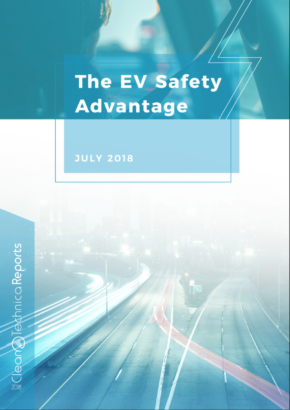 It’s easy to point at electric cars as net business benefits for utilities, but in the case of blockchain,CleanTechnica’s braintrust seems to think that utilities should beware. My assessment is that it’s the customers who will not be particularly benefiting and that utilities will do just fine, and that expectations to the contrary are more ideological or optimistic in nature. 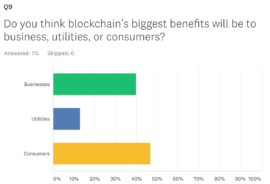 Lastly, it would be remiss not to point out that comments on the survey for this question indicated that some people picked “business” in the absence of an option for picking “nobody.” Skepticism about the benefits of blockchain solutions still exists among the technological optimists of CleanTechnica’s readers.